Paris is the largest city in France and the country’s capital. It has played a central role in thousands of years of French history, and has produced world famous arts and culture for centuries. If you look at a map, it is clear that Paris is not the geological centre of France, but it could be said that it is the symbolic centre of France for the reasons listed above. Or, it could be because of a small plaque embedded in the ground in front of Notre Dame Cathedral. The Point Zero of France. Lots of countries have a Point Zero, and most of them can be found in the capital cities of those countries. Paris is one such example, with its Point Zero located in the centre of the city on the Île de la Cité. A small, unassuming bronze star, it’s inscribed with the words “Point Zero des Routes de France”, meaning kilometre zero of the roads of France. This quite literally means that all roads in France are measured from this location, and therefore all those signs on the highway telling you how far you are from Paris are actually specifically telling you how far you are from Point Zero. Given its significance, I was surprised at how small it was the first time I found the plaque. In fact, most people walk right over it without even realizing its importance. However, those who do seek it out often take part in the many rituals and customs associated with it. Kissing your partner while standing above Point Zero will bring good luck to the relationship. Leaving a coin on the plaque will ensure that your wish is granted. 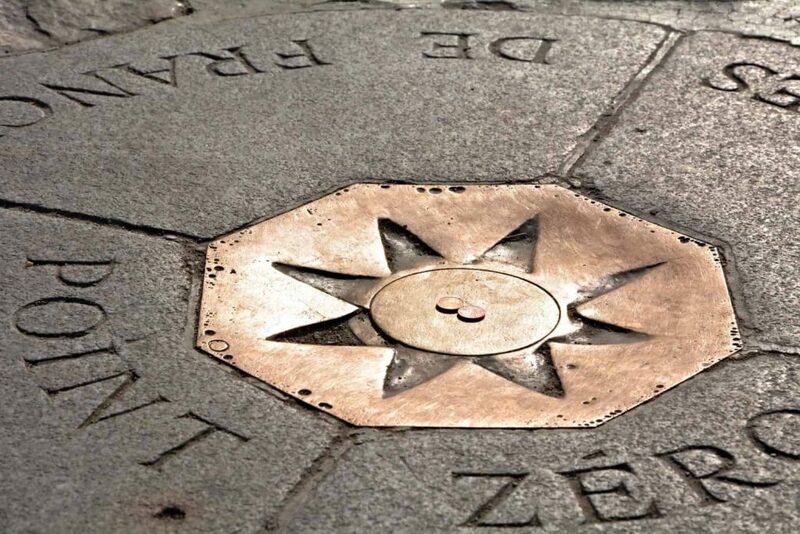 The most common belief is that by simply finding Point Zero, you are guaranteed to return to Paris in the future, which is reason enough to seek out this plaque whenever you find yourself in the city of light. Look for Point Zero in the plaza in front of Notre Dame Cathedral. It’s just behind the line of stone markers, slightly left of centre if you’re facing the cathedral.